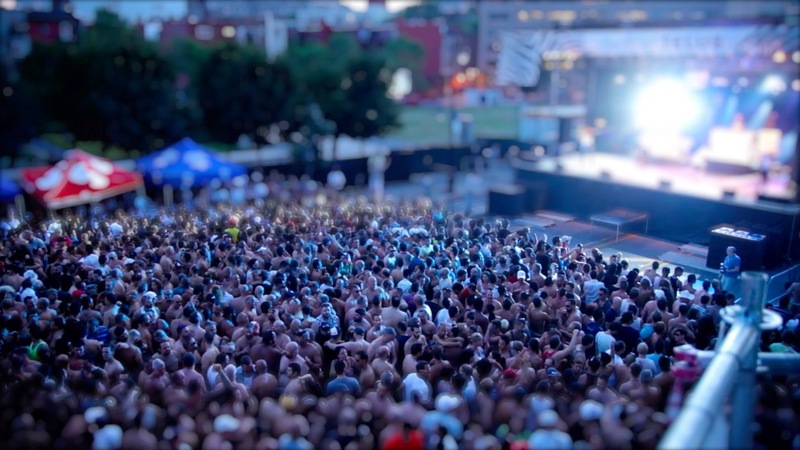 CrumplePop ShrinkRay is a fast and easy way to make big things look tiny by simulating a tilt shift effect. The Mask View checkbox allows you to view exactly where in the footage you’re adding the tilt shift effect to. Move the Focus Position crosshair to change the area where the sharpened area of the ShrinkRay effect is focused. The Focus Height area control allow you to change how tall the area in focus will be while adjusting the Focus Width control will allow you to make the sharpened area thinner or wider if needed. Adjust the Focus Rotation control from 0 to 180 to rotate the angle of the focused area. The Blur Falloff control is set to 25 by default. The Falloff parameter allows you to smooth out the edges of where the blur area meets the focused area. When at 0 the Blur Falloff effect has no effect and a hard line will be seen between the focused and the blurred area. The Blur Amount control adds softness to the area outside of the focus mask when brought up towards 100 or bring it down to 0 to make the masked area sharper. Turning the Blur Gain control up towards 4 will amplify the brightness in the blurred areas of the images outside the focused area to add lightness to the image. Checked “on” by default, the Saturate checkbox will affect the intensity of the color within the image. Turn this checkbox off to return the original level of saturation to the image. Use the Saturation slider in tangent with the Saturate checkbox to change the color intensity of the ShrinkRay effect color. Bring it down -1.0 to desaturate the image completely. Checked “on” by default, the Contrast checkbox will affect the intensity of the difference between light and dark within the image. Turn this checkbox off to return the original level of contrast to the image. Use the Contrast slider in tangent with the Contrast checkbox to change the intensity of the difference between light and dark within the image. The two Patch Controls allow you to clean up the frame and choose which area of the screen you wanted blurred or focus in addition to the main mask view area. Turn on the Show Patch checkbox to activate one of the patch areas, then choose from the Patch Type dropdown menu either Blur or Focus depending on how you’d like to patch the image. Adjust the Patch Position crosshairs to change the area where the blur or sharpened area of the Patch is positioned. Adjusting the Patch Width control will allow you to make the Patch area thinner or wider if needed while changing the Patch Height area control allow you to change how tall the area in Patch will be. Adjust the Patch Rotation control from 0 to 180 to rotate the angle of the Patch area. The Patch Blur Falloff allows you to smooth out the edges of where the blur area meets the focused area. When at 0 the Blur Falloff effect has no effect and a hard line will be seen between the focused and the blurred area.